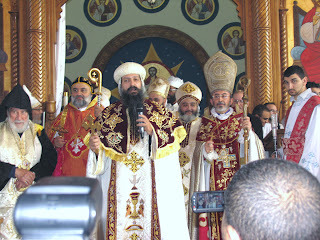 On Saturday November 19, 2011, the Annual Oriental Orthodox Churches’ Concelebration of the Holy Liturgy took place in the sister Coptic Church of St. Michael and St. Mina in Staten Island, New York. His Eminence Mor Archbishop Cyril Aphrem Karim together with local clergy and some parishioners represented our Archdiocese of the Syriac Orthodox Church. His Eminence Archbishop Khajag Barsamian represented the Armenian Orthodox Church and His Grace Bishop David represented the Coptic Orthodox Church. The Concelebration also had representatives of the Archbishops of the Malankara Syrian Orthodox and Ethiopia Church. The celebration started with the procession of the clergy, accompanied by the chanting of the deacons present. The church was packed with the faithful and guests from various churches. Bishop David celebrated the Holy Liturgy with the two other Hierarchs assisting throughout the service. In his sermon, Bishop David welcomed his colleagues and parishioners and explained the importance of such meetings among the Oriental Orthodox community. He went on to wish to maintain this brotherly fellowship with other churches in the future. The parishioners of St. Michael and St. Mina’s church had the unique pleasure of listening to different hymns in Syriac and Armenian in addition to Coptic and English. Following the Holy Liturgy all participants were invited to an Agape meal offered by the hosting church in the social hall.